UPDATE:Samsung has announced that it's permanentlydiscontinuing the Note 7. 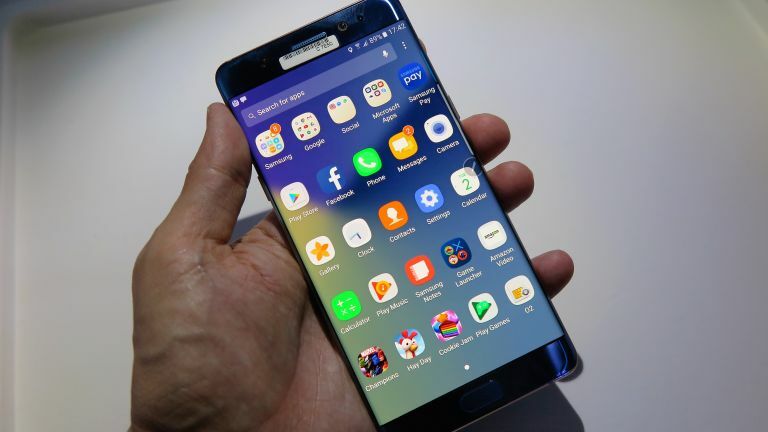 The company stated, "We recently readjusted the production volume forthoroughinvestigation and quality control, but putting consumer safety as top priority, we have reached a final decision to halt production of Galaxy Note 7s. For the benefit of consumers' safety, we stopped sales and exchanges of the Galaxy Note 7 and have consequently decided to stop production." The Galaxy Note 7 is an awesome phone but sometimes things don't always go to plan. And after an initial 35 cases of battery 'issues', Samsung took decisive action and issued a global recall and exchange programme. Crucially, this applies to the original and replacement Galaxy Note7 devices. There is no official word from Samsung UK directly as yet, but there must be a forthcoming UK Note 7 recall of the exchanged devices as well. Samsung previously set28 October as the datefor the Note 7 to go back on sale in Europe, but we don't ever think we'll see this phone for sale on the street again. Samsung previously issued new software to all pre-ordered Note 7 devices to limit the battery charge to 60%, Samsung wants to reduce the risk of incidents and also encourage Note 7 purchasers to exchange their handset. Towards the end of September, some 57 percent of European Note 7 handsets have been replaced already, with 90 percent of those replacements being a like-for-like swap for another Note 7. Three percent of people plumped for another Samsung Galaxy handset (presumably an S7 or S7 Edge), which leaves seven per cent of people who presumably got a complete refund. "To date (as of September 1) there have been 35 cases that have been reported globally and we are currently conducting a thorough inspection with our suppliers to identify possible affected batteries in the market. However, because our customers' safety is an absolute priority at Samsung, we have stopped sales of the Galaxy Note7. What exactly is the issue with my Galaxy Note 7? Based on our investigation, we learned that there was an issue with the battery cell. An overheating of the battery cell occurred when the anode-to-cathode came into contact, which is a very rare manufacturing process error. Although this is isolated to a battery cell issue, we are prioritising the safety of our customers first, so we are voluntarily replacing Galaxy Note 7 devices with a new one. Can I keep using my Galaxy Note 7? While we have found a low risk probability of the issue occurring, at Samsung we believe that your safety is paramount and we would prefer you not to take any risks. We encourage Galaxy Note 7 consumers to take advantage of the exchange programme. How can I tell if my Galaxy Note 7 is impacted? At present we would ask anyone with a Galaxy Note 7 to take advantage of the UK Galaxy Note7 Exchange Programme. Are there any other Samsung phones impacted? No other Samsung smartphones are impacted. This issue is with Galaxy Note 7 only. If you have any queries, contact Samsung UK on 0330 7261000.